Luton Town’s fans have been urged to keep driving the side on in their bid for promotion this term by boss Nathan Jones. On the last Saturday before Christmas, over 1,000 travelled to Blackpool to see their team triumph 2-0 thanks to goals from Jack Marriott and Cameron McGeehan. 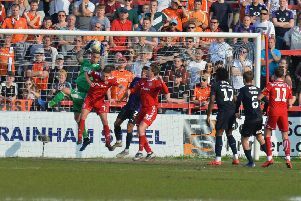 The Luton chief, who embraced a number of the travelling faithful in his now customary away day celebrations, admitted afterwards that the numbers Hatters take with them around the country and at Kenilworth Road has a major influence on the players. He said: “That’s unbelievable for any football club, let alone a League Two football club. I think a few of them had been knocking back a few of the amber nectars judging by it over there, but it’s brilliant to see. I love them fans. I think a few of them had been knocking back a few of the amber nectars judging by it over there, but it’s brilliant to see. I love them fans. Hatters are now back at home twice over Christmas, with Colchester United and then Barnet visiting Kenilworth Road, with big attendances expected over the festive period. Marriott wants Town to improve their form which has seen Luton record just one win in their last five matches on home soil, as he said: “It’s very important. We like playing at home and enjoy playing at home. “We have great fans that support us and we always look forward to it. The atmosphere’s always great and hopefully we can do that (win) on Boxing Day. Meanwhile, Jones hopes his players can take that feelgood factor from winning at Bloomfield Road into their home matches to kick on for the new year, adding: “Let’s enjoy this one and it’s a real, good festive period. “The players have got their Christmas party, so they’ll enjoy it and I want them to, because they work hard and they’re a fabulous bunch to work with.